Does New Tech Excite or Worry Consumers? Home » Global Trend » Does New Tech Excite or Worry Consumers? It’s hard not to get swept up in the clamor and Vegas glamour around the Consumer Electronics Show (CES). This year alone has seen demonstrations of 5G, a smart plank of wood, and the ubiquitous giant TV screens. But this year, it feels like there’s something else in the air as well. Consumer trust in tech may be at an all-time low. The industry has been accused of promoting addictive products, misusing personal data, and not treating workers fairly. It’s even become a topic of interest for mainstream media, as Black Mirror has successfully turned unease with technology into a relatable TV show. So before CES kicked off, and before ever-expanding, ever-more-flexible TV screens filled the exhibition halls, we wanted to check in with consumers directly. Using a handful of examples, we undertook a bespoke survey to discover: do consumers get excited or worried about new tech? 3D printing is a welcome development. While consumers are generally excited about new areas of tech, there’s some ambivalence. In particular, there are reservations about AI. Despite some recent headlines about the threat of homemade guns – the biggest threat felt by our respondents – 3D printing attracted the most excitement of the technologies we asked about. Consumers are primarily excited about 3D printing due to its potential utility. This could mean using it to make medical prosthetics (46%) or spare parts for things (45%), both uses having made waves with some pioneering creations in recent years. Intriguingly, consumers aren’t as wowed by the chance to make potentially any object they want using 3D printing – they’re more interested in how it will support objects they currently interact with. So even though the technology itself may be groundbreaking, consumers currently see it as a support tool to products they’re already familiar with, rather than a way of building new goods at home. In 2013, 3D printing got a namecheck from President Obama in his State of the Union address, and the feeling was the technology would open up limitless potential. But from a consumer point of view, those expectations have dampened slightly, and the outlook is more focused on practicality. Consumers want VR to take them somewhere new. The next most anticipated technologies were smart homes and virtual reality, with smart homes attracting more caveats of concern. VR technology allows users to immerse themselves in unfamiliar or unexplorable environments, and this is exactly what its potential users were most enthusiastic about. Factors specific to entertainment, like games or film experiences, came lower down the list, as was using VR to preview products before buying them. From a marketing perspective, it suggests consumers would respond better to VR-based content marketing than product research. Using the technology to empower users and show them something they haven’t seen before would chime well with the ripples of excitement the technology is currently generating. But building these immersive and transformative experiences should be done with care. The biggest concerns consumers have for VR is that it will lead to users turning away from the real world. The tech industry faces scrutiny partly for its products being seen as addictive, distracting or antisocial, and consumers worry VR could be another vehicle for these tendencies. When it comes to smart homes, convenience and security come up trumps, with an easier buying process being least desired. This means any retail brand promoting a smart home product should primarily appeal to those feelings of convenience and security. The need for security emerged in our respondents’ worries as well, as the top concerns about smart homes were hacking threats and invasions of privacy. Although concerns have been voiced about both technologies, consumers didn’t think that antisocial behavior was the biggest threat with smart homes, unlike VR. Consumers don’t know what to expect from AI. The technology our consumers were most apprehensive of, which also attracted a fair few column inches during CES, is artificial intelligence. Comparing AI to these other technologies may be unfair – after all, smart homes rely on AI to work. But it’s crucial to understand consumer attitudes towards it. For one thing, understanding attitudes to AI will help in branding new products, services, and even entire businesses. The sheer number of possibilities AI could lead to excites and concerns consumers in equal measure. Whereas attitudes toward something like 3D printing are more rooted in how they can improve the here-and-now, the biggest excitement about AI comes from its ability to accomplish things we don’t even know about yet. 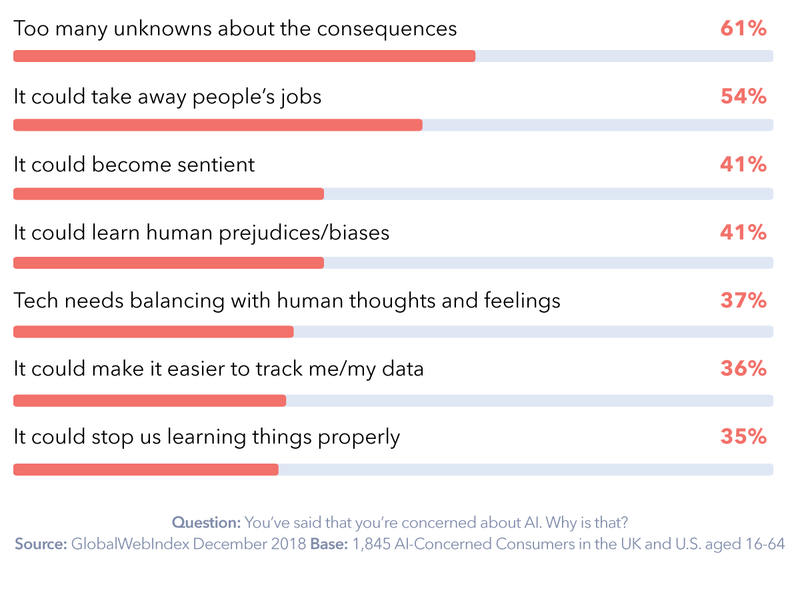 But at the same time, its potential unknown consequences represent internet users’ biggest fear, closely followed by AI-powered automation taking away jobs. It may not be enough for consumers to opt out of investing in AI-powered technology completely, but they’re at least aware of possible social upheaval brought on by the technology. New technologies in 2019 and beyond. This survey consistently found consumers were rarely enthralled by new technology in terms of how it could improve or assist their buying behavior. When using these technologies in commerce or marketing, it’s best to consider some of the more fundamental ways these technologies can empower consumers, as we have outlined here. Despite a turbulent 2018 for the industry, consumers are still generally more excited than worried about tech developments on the horizon, but there is considerable ambivalence in the air. And this ambivalence is most pronounced towards artificial intelligence. Consumers are unconvinced that it’s completely safe and worry it signals negative change in society, making it important to provide them with reassurance when branding AI-enabled services. The post Does New Tech Excite or Worry Consumers? 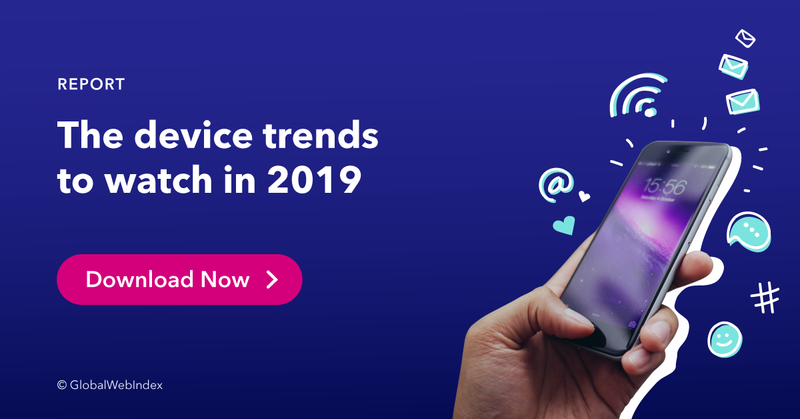 appeared first on GlobalWebIndex Blog.